(CNN) -- An Irish-owned aid ship headed for Gaza won't stop until it's forced to, a former U.N. official aboard the ship told CNN Thursday. "We have not stopped and have no intention of stopping," said former Assistant U.N. Secretary-General Denis Halliday from aboard the vessel. "We will only stop when Israelis force us to do so." The MV Rachel Corrie, named for an American activist killed in Gaza several years ago, was expected to arrive late Friday or early Saturday off the coast of Gaza. Israel was offering to unload its cargo in Israel's Ashdod port, screen the material and then deliver it to Gaza, but fears of another high-seas confrontation were in the offing. However, Halliday said the 11 people aboard the ship -- which is carrying 550 tons of cement to help in the effort to rebuild schools, homes and other building destroyed in Gaza -- had no plans of confronting Israelis who may stop the vessel. "We will stand back and show we are harmless and unarmed -- we will put up no resistance," he said. "We're not going to make any silly mistakes." Earlier Thursday, a Free Gaza Movement activist told CNN that the Rachel Corrie delayed its voyage while it was being equipped with video and satellite devices to to record what is happening on the vessel. Adam Shapiro, Free Gaza board member, said the additions to the ship are being made for safety purposes. Shapiro said Israel has made it clear it would intercept the ship, and he hopes recording technology on the ship will make a difference in the behavior of any soldiers who board the vessel. "Israel will be sensitive to the fact that we'll be recording what's happening and streaming it live," said Shapiro, who didn't identify where the Rachel Corrie is docking. He said it will head toward Gaza within the week. An Israeli government official, who spoke on background because of the diplomatic sensitivity of the issue, told CNN the government is offering to receive the ship's cargo, as it has offered other vessels, if it docks at Ashdod's port. That was the same deal rejected by the flotilla of six ships bound for Gaza before Israeli commandos raided one of them Monday. Halliday acknowledged that cement the aid ship is carrying is not considered by Israel as a form of humanitarian aid, but he said the ship will push forward to Gaza: "We don't want to see our cement sitting there" in Ashdod. Michael Oren, Israeli ambassador to the United States, said the two countries are having initial talks about opening up a dialogue to address the civilian needs of the people in Gaza and Israel's security interests. However, Oren said the dialogue would not involve an end to the Israeli blockade of Gaza. Referring to comments by U.S. Secretary of State Hillary Clinton, who called the situation in Gaza "unsustainable," Oren said, "We don't disagree with that. We are open to suggestions on how to ameliorate the situation." Haaretz, the Israeli daily newspaper, reported on Thursday that a "diplomatic solution" that would allow the vessel to dock at Ashdod "seems imminent." Citing European diplomats and senior Foreign Ministry officials in Jerusalem, the newspaper said "quiet messages have been exchanged over the past few days between Israel and the group operating the ship, to allow it to dock" in Israel. But Shapiro said people on the ship deny that report and believe it is part of a misinformation campaign by the Israeli government. Aside from himself, Halliday said there are 10 others on the ship: Nobel Peace Prize winner Mairead Maguire, six Malaysians and Free Gaza activist Derek Graham and Graham's wife and an Irish lawmaker. Graham has said the plan was for the Rachel Corrie to be unloaded in Gaza and then return to Ireland. "We're just hopeful the Israelis will let us make a small gesture for the people of Palestine," Halliday said. "Because we believe Monday was a gross error." He added that Monday's confrontation resulted from "faults on both sides," saying the effort on the Rachel Corrie is a "different ball game." The Irish government is asking that Israel not interfere with the ship. Haaretz said it would have been in the Monday flotilla that had been halted by Israel but was delayed because of technical problems. According to the Irish Ministry of Foreign Affairs, the vessel, owned by the Irish Free Gaza movement, sailed from Dundalk, Ireland, in mid-May. Aboard are a number of Irish citizens. Ireland's minister of Foreign Affairs, Micheal Martin, has told the lower house of the Irish parliament that he has asked the Israeli ambassador to convey to his government his request that, "following the tragedy which has occurred, the Rachel Corrie be allowed to continue unimpeded, and to deliver its cargo to Gaza." "We will be watching this situation very closely -- as indeed will the world -- and it is imperative that Israel avoid any action which leads to further bloodshed," he said. The Rachel Corrie left Ireland laden with educational materials, toys and medical equipment along with the cement in the latest effort by peace activists to deliver humanitarian goods and break Israel's blockade, according to aid organizers. Israel says it needs to have its naval blockade of Gaza to stop weaponry from being transported to militants there intent on attacking Israel. The Free Gaza Movement said customs officials and a senator from the Irish Green Party inspected the vessel and found no weapons. Israeli commandos stormed a six-vessel flotilla early Monday in order to stop it from reaching Gaza. Violence erupted on one of the ships, leading to the deaths of nine people, all Turkish citizens -- including one of dual Turkish-American nationality, as well as many injured people. Israel said its commandos were attacked and passengers said the troops assaulted them. Israel briefly detained the 600 or so flotilla passengers. The state eventually released all of the foreigners and four Israeli Arabs from prison. The Israeli citizens, all activists, remain under house arrest until next week. 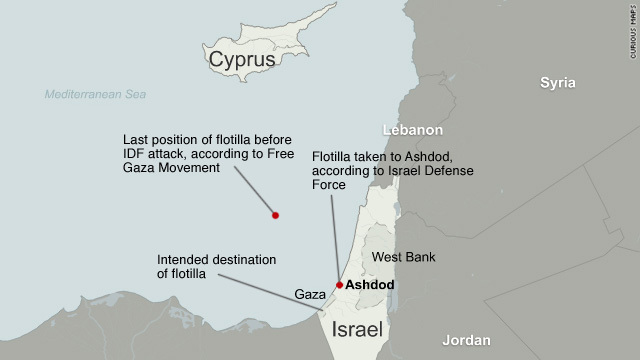 One of the four Israeli Arabs -- Sheik Raed Salah, leader of the northern branch of the Islamic Movement in Israel -- told CNN that some people initially aboard the flotilla have since disappeared. "There is only one explanation -- that some passengers were thrown in the sea," Salah said. "No one knows how many are there, unless after a detailed search that might last days or weeks, we don't know. 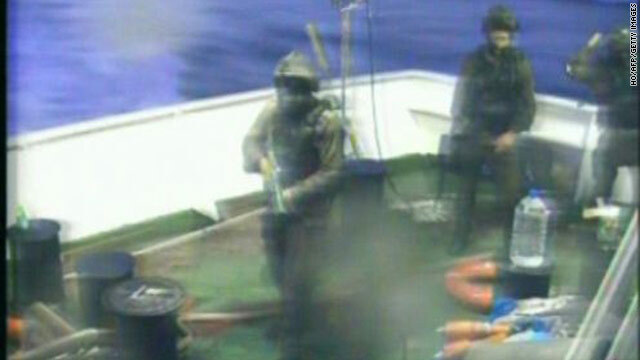 There are passengers who were thrown in the sea during the attack on the freedom flotilla." The violence has sparked official and grassroots rage from capitals and street protests outside the Middle East on Thursday. South Africa recalled its ambassador to Israel. Turkish President Abdullah Gul said that the once-close Turkish-Israeli ties "will never be the same. This incident has left an irreparable and deep scar." Thousands of angry people attended a mass funeral in Istanbul for the victims and chanted slogans against Israel, and Turkish activists on the ship returned from Israel to a hero's welcome. At the United Nations, the Security Council has called for an inquiry of the raid and the Human Rights Council voted for a probe, but Israel says it alone and not an international entity should be investigating. Mark Regev, the Israeli prime minister's office spokesman, said after military operations, it is Israel's "standard practice" to carry out "a prompt, professional, transparent and objective investigation in accordance with the highest international standards." One Israeli official, who asked not to be named because he was not authorized to comment on the subject, said, "the demand for a U.N. investigation shows a clear double standard towards Israel. It shows hypocrisy and singles out the Jewish state for special treatment." "There is no case in recent history where a democratic country's army has been involved in an overseas operation in which civilians have been killed, and has been subjected to an international investigation." The Israel Defense Forces Military Advocate General -- the body that ensures that the rule of law is upheld within the military -- said in a report that the interception of the Gaza flotilla was legal under international law. The body said that international law allows for a country to stop a vessel in international waters if it attempts to breach a naval blockade -- even before such a blockade is actually breached. "If it resists capture and refuses to stop, after prior warning, it may be attacked," the MAG said. Israeli Foreign Minister Avigdor Lieberman told Israel Radio on Thursday that members of the flotilla were carrying large amounts of cash, a suggestion that people on the ship had untoward and not humanitarian intentions. An Israel Defense Forces official said troops continued to count money they found, saying that they discovered envelopes in bundles ranging from $8,000 to $10,000.